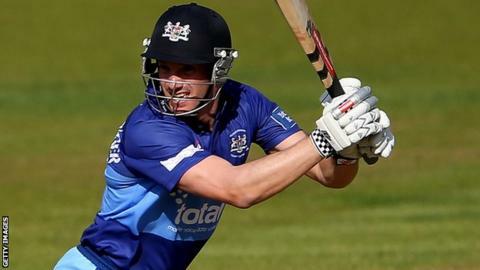 Captain Michael Klinger has agreed a new contract with Gloucestershire for next season. He will return to the club in June 2015 and be available for the Twenty20 and 50-over campaigns and the majority of the Championship season. The 34-year-old opener will fly back to his native Australia this week as he continues his recovery from the broken arm he suffered last month. He will play for Western Australia over the winter before returning to Bristol. "We started talking about a deal for 2015 as soon as his plane touched down for this season," chief executive Will Brown told BBC Radio Bristol. "We wanted to keep him and he's desperate to stay in Bristol so we found a deal to keep him for four of the six months of the season." Klinger made 2,173 runs for Gloucestershire in all competitions in 2013, including four Championship centuries, and averaged 87.75 in the 40-over competition. This season has been less successful and was cut short when his left arm was struck by a bouncer bowled by Derbyshire's Mark Footitt in their One-Day cup game on 22 August. Brown added that the shorter contract for Klinger meant they can look to add specialist bowlers to their squad, following the departure of Will Gidman to Nottinghamshire and Ian Saxelby's retirement. "It gives us a couple of months' salary to beef up our bowling attack, hopefully for the beginning of the season," he added. "It's a good result for both sides."